A few years ago we released a collection titled “Free Motion Christmas” that took the concept of free motion quilting and adapted it to embroidery machines. There were 20 different designs that all connected left to right so that when the quilt was pieced together the stitching looked continuous. We have now taken that same concept and created our new Free Motion Animals collection. There are 20 different animals that are playfully drawn and digitized using our free motion embroidery technique. There are dogs, cats and even elephants. Each of the designs comes two different ways. The first version is a single pass stitch; this version resembles free motion the most since it is only one layer of thread. The second version is a 3-ply or as it is usually called a bean-stitch. This stitch is much bolder and looks great when you stitch it with contrasting thread. 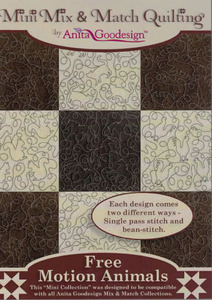 We used the 3-ply stitch for all of our quilts shown in this project. You can mix the different animals together or use only one animal and change the fabric, either way you will have a beautiful quilt when you are finished.